Nissan has revealed its all-new Qashqai. The company had previously released cryptic imagery of the new model, but today the full design was unveiled at a launch event in London. As expected, the new car features a more assertive nose, with Murano-esque lines and a large, clamshell bonnet. The new Qashqai's side profile, meanwhile, is more familiar, with the slash-cut glasshouse and chunky plastic body protection both design cues that carry over from the old car. At the rear, bold tail lights and pronounced, bulging haunches complete the picture. Beneath the skin, Nissan's claiming that the new car majors on technology, with a plethora of equipment available including front collision avoidance, driver attention support, lane departure warning and moving object detection. Higher-spec models will also feature LED headlamps, while diesel models with manual transmissions will also get an active grille shutter, that'll close when extra cooling isn't required to improve frontal airflow. An all-turbocharged engine line-up will feature, with a 114bhp 1.2-litre petrol replacing the outgoing naturally-aspirated 1.6. Two diesel engines – a 109bhp 1.5-litre and a 129bhp 1.6 – will also be available at launch, while a further, 1.6-litre turbocharged petrol with 148bhp will join the range in September next year. A six-speed manual transmission with two-wheel drive will be standard on all, while the larger diesel will also get the option of a CVT automatic gearbox. Four-wheel drive will also be available as an option. Nissan has already confirmed that the new model will replace its predecessor on production lines at the company's Sunderland plant. 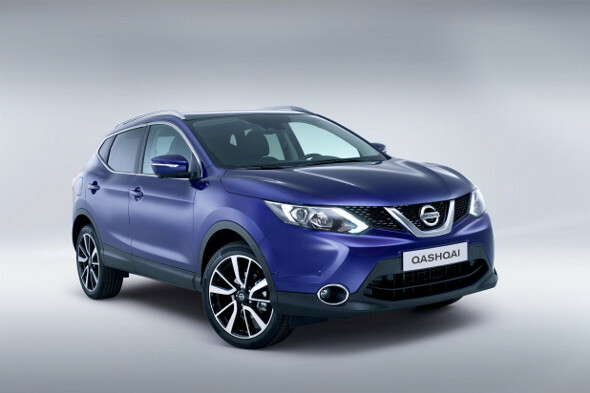 The new Qashqai will go on sale in February 2014.